Hello, Latisha, here with you today, and I am introducing the S2-121 Happy Holidays Sentiment. It seems like we are invited to a lot of holiday parties, and I’m never quite sure to bring. So, I like to make card sets for the hosts. 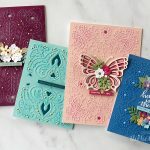 Using the Happy Holidays Sentiment die, I created a trio of cards. Packaged and ready to give as a gift. Cut/emboss red cardstock with die #7 (the smallest die size is die #1) from the A2 Modern Stationery set. Repeat step #1 using white cardstock. The white diecut which will be the back, score one inch down from the top. Place adhesive above the score line. Attach to the red die cut, this will create the card base. Cut/emboss white cardstock with die #6 from the A2 Modern Stationary set. 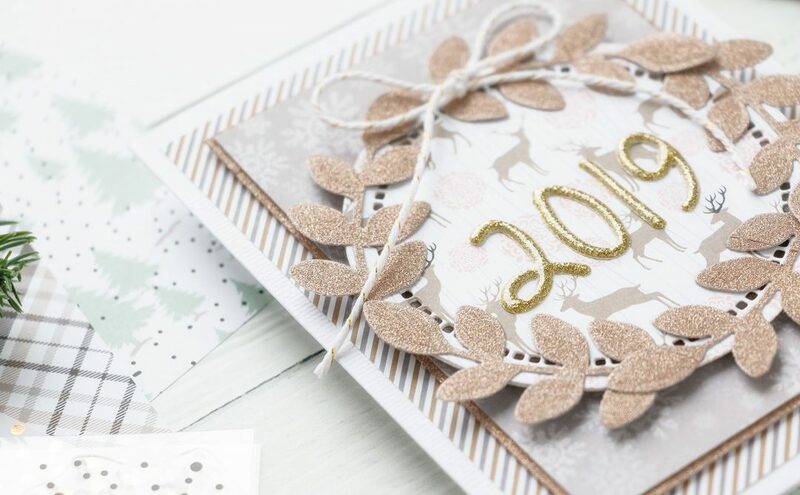 Place the Happy Holiday Sentiment die onto the white cardstock. Emboss. 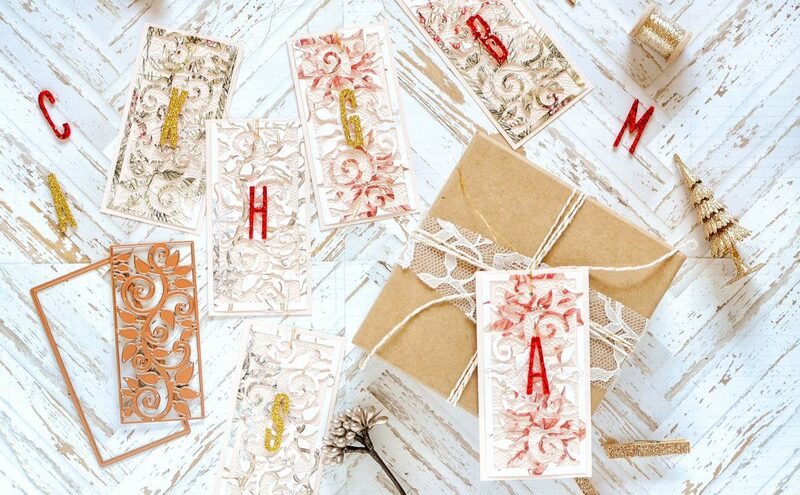 Diecut red cardstock using the Happy Holidays Sentiment. Adhere to cardfront. Die cut green cardstock using the Sprig die. Cut into 3 pieces, adhere and place onto the cardfront. Add twine & rhinestones to embellish. Adhere panel to the card base using foam squares. Cut/emboss white cardstock with die #7 from the A2 Modern Stationery set. Repeat step #1 using pattern paper. 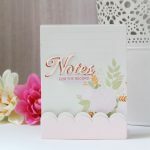 Attach to the pattern paper die cut, this will create the card base. Cut/emboss white cardstock with die #6 from the A2 Modern Stationery set. Repeat step #6 using pattern paper. Cut in half & adhere to the white diecut. Wrap red ribbon around the white diecut panel. Tie bow. Attach red button to the bow using twine. Cut/emboss pattern paper using die #5 from the Standard Circles Small set. Cut/emboss white cardstock nesting die #5 & #6 to create a frame. Adhere the circle diecuts to the panel using foam squares. 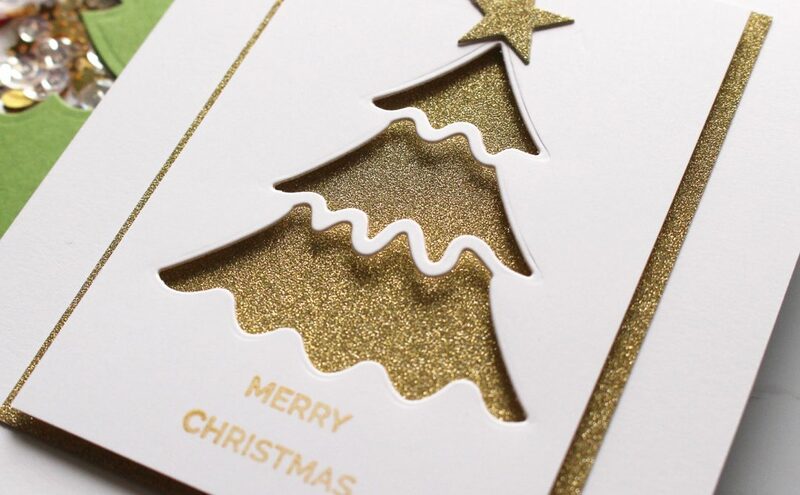 Diecut white cardstock using the Happy Holidays Sentiment die. Adhere to the circle. Add panel to the cardbase using foam squares. Add stickles to the sentiment. On one of the diecuts, score one inch down from the top. Attach to the other die cut, this will create the card base. Die cut pattern paper using the accent die from the A2 Modern Stationery set. You will need 3 diecuts. Adhere diecuts to the cardbase. Cut/emboss white cardstock using die #5 from the Standard Circles Small set. Cut/emboss pattern paper nesting die #5 & #6 to create a frame. Diecut black cardstock using the Happy Holidays Sentiment die. Adhere to the circle. Add red rhinestones to the card. Wrap ribbon around the card front. Tie a bow. Add black stickles to the sentiment. 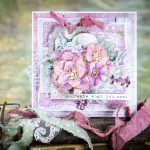 Latisha Yoast blogs at A Busy Little Craftee Bee.